Group sprite of the Yoshi Island Spirits. Several of the Yoshi Island Spirits celebrating Yoshi's victory in locking away Bowser. Hongo is the leader of the Yoshi Island Spirits and the Spirit in control of the Forbidden Pop-Up Book. He is responsible for accidentally sealing Yoshi's Island in the Forbidden Pop-Up Book and for the banishment of the Spirit Who Loves Surprises. He is elderly and pious, because he wanted to help Yoshi but accidentally sealed Yoshi Island in the Forbidden Pop-Up Book, and didn't bring Yoshi Island back to normal because Bowser would attack the island again. Another example of this, when Yoshi defeats Bowser, he gets very grateful for Yoshi and makes him a meal, and accepts the Spirit Who Loves Surprises to work with him again. The Spirit Who Loves Surprises is a lively Spirit who gives Yoshi the power to rotate the entire world, helped him throughout the game, explained what he must do to have Yoshi Island turn back to normal, and hosted the Bonus Mission!. He was fired by Hongo, because he didn't know how to keep secrets. At The Tale of Bowser's Fields, he controls a fake Bowser to attack Yoshi as a test to see if he is ready to battle with Bowser. At the end of the game, the Spirit Who Loves Surprises returns to work with Hongo. The Spirit of Cuteness loves cute things more than anything else and is very friendly. She cares very much about the Egglings and explained to Yoshi what Bowser did with the Egglings and asks Yoshi to save them. The spirit awards Yoshi with a Happiness Medal if he finds a certain amount of Egglings in each stage. She is a round, flying pink creature with white wings. Also known as Spirit of Money, the Spirit of Greed loves money and gold and judges people on how much money they have. He only allows Yoshi to go to the next level if he gave him a certain number of Coins. He has a pouch full of his gold and money, and resembles a golden mouse. 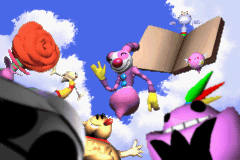 All of the spirits, seen during the ending cut-scene. Also known as Spirit of Strength and Spirit of Might, the Spirit of Power is the strongest of the Spirits and likes mighty and strong people. He only allows Yoshi to go to the next level if he defeats a certain number of enemies. This trial is almost the exact opposite of the Spirit of Kindness. He resembles an obese purple genie. Also known as the Spirit of Swiftness, the Spirit of Speed is very fast, energetic and despite being so competitive, she is very friendly. She loves to challenge others to races, and does not like people who just stand without doing anything. The Spirit of Kindness is a benevolent and gentle spirit that likes kind people. Her tasks for Yoshi always involve defeating the least amount of enemies in a level as possible, unlike the Spirit of Power. She resembles a rose. Also known as the Spirit of Scariness, the Spirit of Fright likes to scare people. To satisfy himself, he sets up a giant rolling spindle with spikes to scare Yoshi. Yoshi must reach the goal and avoid being sucked in the spikes. He resembles a mummy. This page was last edited on February 26, 2019, at 21:06.